If there’s one thing you check off your list this summer in Steamboat Springs, it has to be tubing the Yampa River. 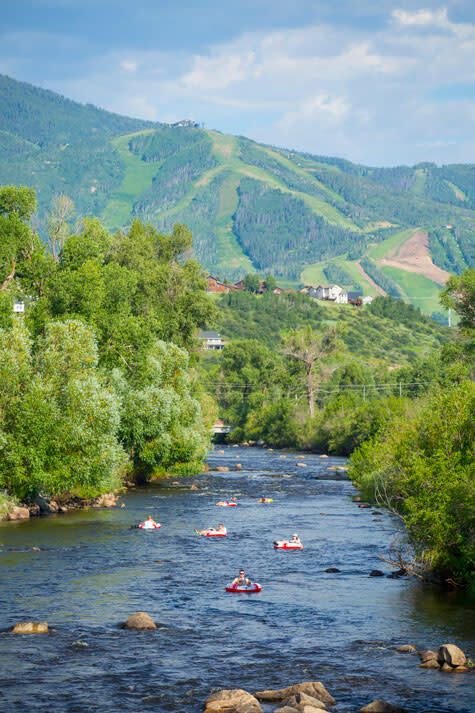 A local favorite and must-do activity, tubing the Yampa offers a chance to experience downtown Steamboat from a comfortable inner tube while splashing in the refreshing waters of the Yampa River. The float can be as long or as short as you’d like, and there’s plenty of riverside stops like parks, restaurants and bars along the way. Small rapids, standing waves and rock features will carry you down the river on this exciting, family-friendly ride, which can last from 1 to 3 hours depending on your put-in and take-out points and the river’s flow. The easiest way to avoid the complications and the hassle of parking and shuttling cars upstream is to use one of our summer tubing outfitters. Tubing outfitters have everything you need for your adventure on the river including rental tubes, life jackets, dry bags, appropriate footwear, and most importantly shuttle service. In an effort to keep the river from becoming overcrowded, there is a limit on the number of trips the commercial tubing outfitters are allowed each day, so be sure to reserve your spot on the river to avoid disappointment. The river has been separated into zones by the City of Steamboat Springs in conjunction with the Colorado Division of Wildlife to give every user group a share of this wonderful resource. Rental tubing is allowed downstream from the 5th Street bridge, while private tubers are encouraged to float from no further than Fetcher Park; leaving the quieter upper stretch of river open for fishing. If you choose to tube privately it is recommended that you park your car downtown or at the Community Center/ Stockbridge Transit Center and ride the bus to your put in location. Parking is extremely limited at all put in locations including Fetcher Pond and Weiss Park. Using the Red Line you can park at the Stockbridge Transit Center (stop #10) and start at either Fetcher Pond (stop #41) for the longest ride or Dr. Rich Weiss Park (stop #25) and float all the way back to your vehicle. Please be aware that bus drivers will not allow wet people or inflated tubes on the bus, so if you opt to ride the bus post-float be sure you have a dry bag for your belongings. Tubing season typically begins in June and lasts through September. Conditions are reliant on the amount of snow-melt and rainfall Steamboat receives. If the water levels are too high or too low tubing will be halted. Check the river flow to see if it is at a safe level for tubing. Water levels above 700 cubic feet per second are not safe for tubing. Water levels under 700 cubic feet per second may still not be safe for those who are not strong swimmers. Be sure to share with the outfitter your comfort level in water. Life jackets are always recommended, especially when the river is at a high water level; small children should wear a life vest at any water level. Wear shoes with straps (not flip-flops) and a swimsuit or clothing you don&apos;t mind getting wet. River shoes are available for rent at most tubing outfitters. Be aware of what you bring with you; you may tip over and lose gear. Respect other tubers, people walking along the core trail, and fishermen. Try to tube in small groups (about 5 – 10 people). Leave no garbage behind. Please take everything you bring with you out with you. Help us keep the Yampa River beautiful! NO alcohol, dogs, or glass. The safest and most reliable way to tube the Yampa is to go through one of our local tubing outfitters. Tubing outfitters offer rentals and shuttle rides for the easiest, most enjoyable tubing experience. For more tubing tips, check out Tips for a Great Day Tubing the River.